Thank you for visiting the new version of my official website, BigBen7.com. Over the years, a unique fan website was brought to my attention – BigBenNews.com. It was run by Erin Cox, who I didn’t know, but her loyalty and effort on the site amazed me and my family. She never asked us for anything, and maintained a fun and refreshing site for people to visit. We asked Erin if she would be willing to take over my official site and merge her fan site, applying her original style and touch. Thankfully, she accepted, and her efforts are what you see today. I hope you enjoy it and I really appreciate your support. We’ll attempt to provide new things often, so please come back soon. 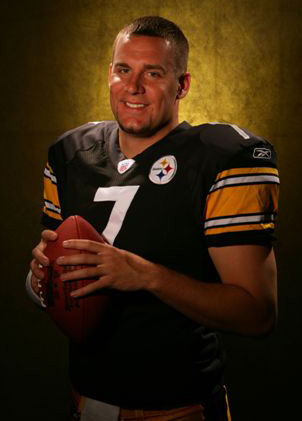 The purpose of this site is to provide fans with the latest news on the career and community involvement of Ben Roethlisberger. All images that appear on this site are copyrighted to their respective owners and BigBen7.com claims no credit for them unless stated otherwise. This web site may contain copyrighted material whose use has not been specifically authorized by the copyright owner. This page is operated under the assumption that this non-profit use on the internet constitutes ‘fair use’ of the copyrighted material as defined in Section 107 of the US Copyright Law. If you own the rights to any of these images or videos and do not wish them to appear on the site, please contact the administrator and they will be promptly removed. All data is posted purely for educational non-commercial informational purposes and not in order to detract from the people who have copyrights. No copyright infringement intended. Links from BigBen7.com to other websites are provided only for the convenience of fans. Fans acknowledge and accept that such links do not constitute or imply any endorsement of such external websites, their sponsors, products, or services by BigBen7.com, and that BigBen7.com is not responsible or liable for any content, products, services, practices, materials or other information available on linked websites. This site was designed by Nathan Schivley. All updates and additions are maintained by Erin Cox. Submissions of news, fan stories, photos, fan art, links to articles, etc… are always welcome and greatly appreciated! (full credit will be given for any contributions). Note: Emails sent to the above address go directly to the adminstrator of the website. They are not being sent directly to Mr. Roethlisberger or anyone on his staff. *Thank you so much to fan contributors Jan Banko, Trish Tierney, Rebecca Miller and K.F. for their assistance with both the Statistics page and the Biography page on this site! Also, a special “thank you” to Rebecca for the fantastic images/logo designs used throughout the site!